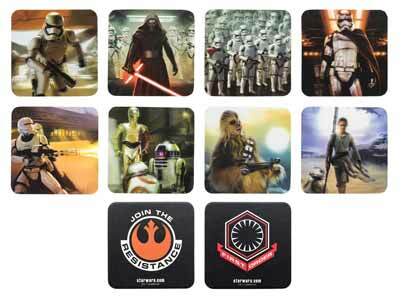 Paladone's Star Wars coaster pack is the perfect accessory for your home. For the grown ups, they provide an attractive protection for furniture - wherever you place your hot beverage of choice. For the younger member of the family it will get them used to using coasters in order to avoid creating water rings on your furniture. What small mind could resist the Force when it comes to placing their glass of juice on top of a cool Star Wars coaster? What's great about this pack, and sets it aside from the numerous other Star Wars coasters (aside from the cool 3D lenticular design), is the fact you get eight in the pack. That's enough for a large family dinner table and still means you have some left over for the living room table and for one by your computer. Each coaster is constructed of what appears to be pulped cardboard (or possibly cork) to give it that old fashioned feel of coasters at the cheaper end of the spectrum. The lenticular image is simply stuck on the top - there's no protective layer to protect the image. But then unless these are expected to receive heavy usage there's very little chance of damage. On the back is a battle cry and logo for either the Resistance or First Order, depending on which character is on the front. These are cheap and cheerful and the main selling point, the 3D lenticular image, ensures this sees them standing out from the numerous other Star Wars related coasters out there.